The author served in the South Dakota National Guard and then, for 30 years, in the Air Force. Quote: Gain insights from the author’s military journey and transition into civilian life. 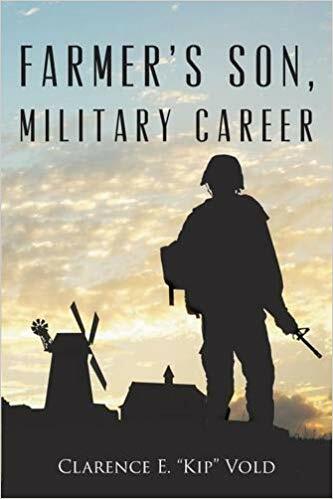 For people who are unsure about college or consider enlisting in the military, the book “Farmer’s Son, Military Career” by Clarence E. “Kip” Vold should help them decide on the course for their future. In his autobiography, the author, who is an Air Force veteran, shared the factors that influenced his military journey. Though born as a farm boy, he did not have farming in his bones and was determined to follow in the footsteps of his brother and uncles who went to college. His father was the kind who believed that his children should follow their own dreams and not worry what other people say or think. “He was always willing to give advice and encouragement and then expected us to make our own decisions,” said the author about his father. However, after high school graduation, he entered college but later had his doubts. He was not sure what he was doing that time. Feeling unhappy, he returned home to work temporarily at the farm and returned to active reserve status in the National Guard. He failed the physical exam for the Air Force Aviation Cadets program. After his discharge from the National Guard, he enlisted with the Air Force, much to the disappointment of his father who hoped that he would take his place at the farm. The author intended to serve one 4-year enlistment to figure out what he wanted to do with his life, but the four-year enlistment turned into an illustrious 30-year career. He retired from active duty as a Chief Master Sergeant. As expected of a veteran, he transitioned into civilian life and even completed college. The author’s insights and experiences will greatly benefit anyone who will read his book. Don’t miss the public display of the author’s autobiography at the upcoming 2019 London Book Fair New Title Showcase on March 12-14, 2019. Published by Page Publishing, Inc.
Clarence Vold was born in Mitchell, SD on February 19, 1940. Though raised in a farm, he did not see his future in farming. He went to college and then enlisted in the Air Force. Throughout his career in the Air Force, he served as an electronics technician, military training instructor and instructor supervisor, and a KC & EC-135 boom operator until grounded medically. He scheduled alert and flight training, missile crew alert duty and administrative airlift mission for 5th Air Force, then aircraft operations management. His boom operator experience included 43 combat missions over Thailand and the Gulf of Tonkin. After retirement from active duty in 1989, he returned to college where he enjoyed the writing assignments and worked for the Hertz Corporation for five years.